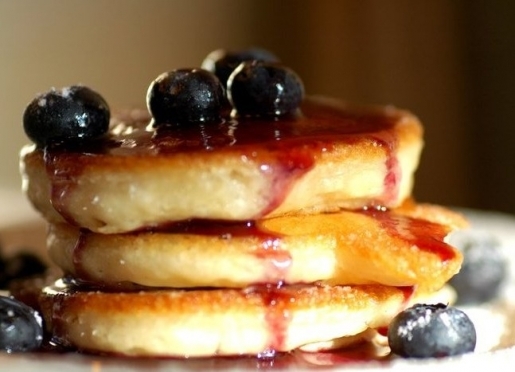 Delicious Full Country Breakfasts - Voted Best Breakfast in the South for 2 years! 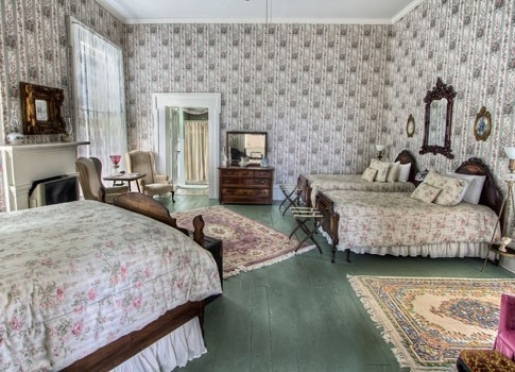 This working farm is stately set on 14 tranquil acres in the heart of Kentucky's scenic Bluegrass Region (an hour southeast of Louisville and an hour southwest of Lexington), and the home is considered one of the best preserved Antebellum Homes in the Commonwealth. Its tranquil, country setting is surrounded by picturesque rolling hills of bluegrass with a 3,000 acre race horse farm on one side and 300 acre cattle and tobacco farm on the other - a beautiful and restful place to seek refuge and enjoy the country fresh air. For your comfort, each of the seven guest rooms are air conditioned and each have a private bath. Relax at our peaceful, park-like setting. You will find double rockers on the front porch, garden benches, and a large patio area with tables and comfortable seating set among ancient maple trees. Enjoy interacting and learning about our Alpacas & Llamas. . A picnic table and grill are available for guest use. Depending on harvest time, guests are welcome to pick from the 50+ orchard of apples, peaches, pears, cherries, and plums. We also grow grapes, raspberries, blackberries, blueberries, and an Herb Garden for Guest indulgence during breakfast. And of course, our Official Greeters and companion pets, Sophie and Sampson, our Golden Retrievers, are always available to you! 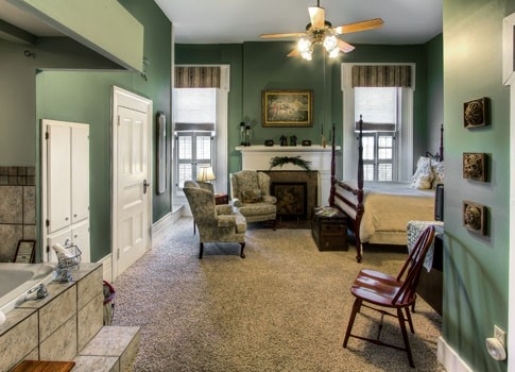 Please visit Maple Hill Manor's website for a full list of amenities available for you. Travelers are always looking for memorable and relaxing experiences. Let’s discover more through the words of our innkeepers. Many thanks to Todd Allen & Tyler Horton for sharing their own secrets with BBOnline.com! To enjoy Kentucky's scenic natural beauty and unique attractions, such as the Bourbon Trail, Wine Trail, Horse Farms, Mammoth Cave, and Lincoln and Civil War Heritage Trails. 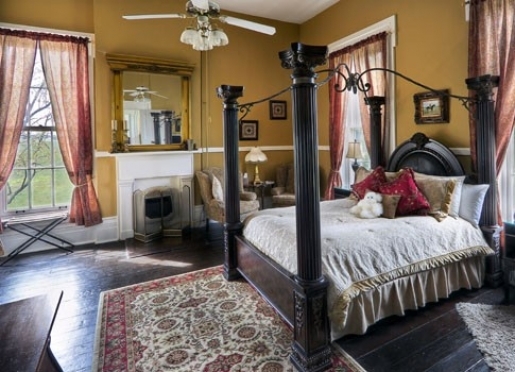 25 Years of Award-winning B&B Accommodations and working Alpaca & Llama Farm. Considered one of the best preserved Pre-Civil War Antebellum Plantation Homes in Kentucky - designated a Kentucky Landmark Home. Also, the fact that it was the birthplace and childhood home of Phil Simms, well-known Quarterback for the New York Giants and Superbowl XXI's MVP. Tranquil country estate setting, completely surrounded by picturesque farmland, neighboring a 3,000 acre race horse farm. Birthplace of Kentucky Bourbon and its related Bourbon Distillery Tours and Tastings. Voted Best Breakfast in the South for 2 years, selected as TOP 10 Farmstays in the U.S. for a Haycation, by USA Today, and voted "Kentucky's Best B&B" by Kentucky Monthly Magazine. President Abraham Lincoln was born in this area. The Lincoln Legacy began in Springfield, Kentucky. Kentucky Bourbon Trail, Wine Trail, Civil War Battlefield and Museums, Lincoln Heritage Sites, Outdoor Drama of Stephen Collins Foster - The Musical, Horseback Riding, Race Horse Farm Tours, Horse Racing, Mammoth Cave National Park - the world's longest cave system, Adventure Activities such as biking, skydiving, hiking, boating, and hunting, and the abundance of Agritourism Operators - farms open to public to tourists (Horse Farms, Historic Farms such as Shaker Village at Pleasant Hill and Abbey of Gesthsamani, U-Pick Fruits and Vegetables, Fruit Orchards, Fiber Farms, Wineries/Vineyards, Nature Reserves, Amish Farms/Markets, and Kentucky's Agriculatural Heritage Center). There is a wide variety of attractions for all ages which are open year-round. Mordecai's on Main, specializing in bourbon entrees, Springfield, within 2 miles from the Inn. 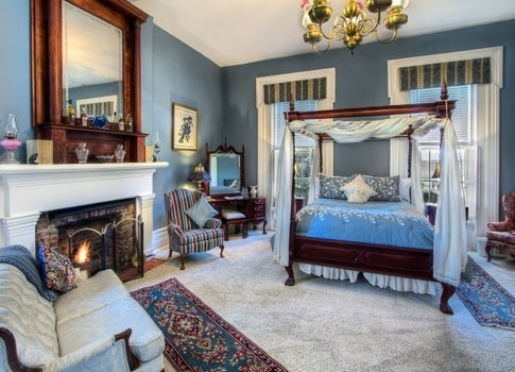 We have 7 spacious antique-appointed guest rooms. Yes, with certain restrictions; Please our website for Pet Policy. From its inception, Maple Hill Manor has been a love story, beginning as a wedding gift to a bride. 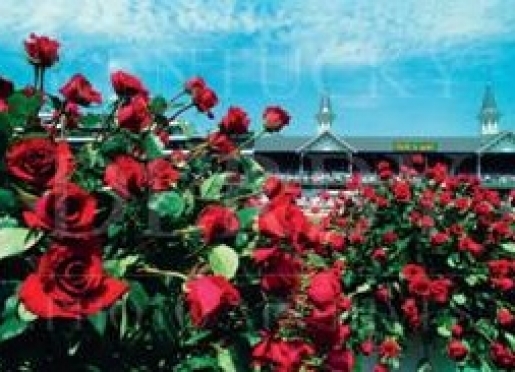 Today it carries on the tradition of romance providing the perfect setting for Weddings, Receptions, and Honeymoons. Maple Hill Manor offers an elegant place for a truly memorable event - whether inside the Manor or the beautiful grounds with its Flower Gardens, Wedding Gazebo, Tent Areas, Horse and Carriage Rides, not to mention the picturesque country landscape which surrounds this gracious plantation home. Your Wedding Guests will enjoy the romantic setting and exquisite catering services. You will be assured of having Professional Event Planning related to overall coordination and preparation. Our dedicated staff will provide a reception or rehearsal dinner that will be nothing less than spectacular! 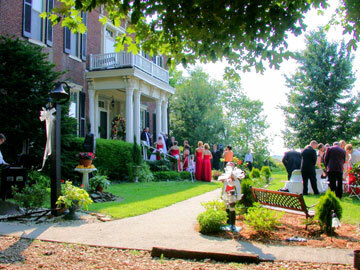 If you have dreamed of a having a magnificent wedding, there's no better place than Maple Hill Manor. Together, we will create a memory that will last a lifetime. For more information about using Maple Hill Manor as the location for your wedding, please call or email. Maple Hill Manor specializes in hosting corporate meetings, executive corporate retreats, business and professional group socials, educational workshops, and church retreats. We are centrally located approximately one hour from Lexington or Louisville, only 2 hours from Cincinnati or Nashville, and less than 3 hours from Indianapolis or Knoxville. In addition, we are less than six hours from each of the following cities: Atlanta, Chicago, St. Louis, or Columbus. Our facilities include a meeting room with seating for 30 with all the necessary meeting room amenities for corporate meetings and gatherings, church retreats, workshops, banquets, etc. Our formal dining room will comfortably seat 25, and may be expanded for a total of 50 dinner guests. 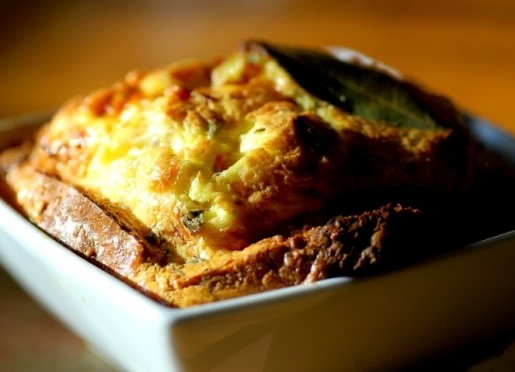 Meals for meetings and conferences are available on a pre-arranged basis from our Catering Staff. Beverage Service and snacks can be provided for conference attendees as needed. Conference Rates are as follows:For more information about our Corporate Retreat services, please visit our website. Choose from these Maple Hill Manor Murder Mystery Themes - which of these fits your group? Searching for something different to do with your group of Friends? Interested in a Special Occasion Activity such as a Birthday, Anniversary, or Retirement Celebration? 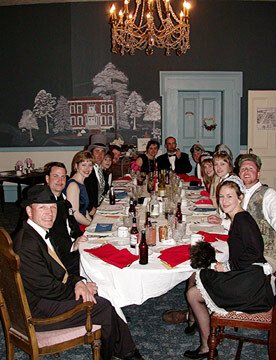 Murder Mystery Events at Maple Hill Manor are sensational! For over 15 years, Maple Hill Manor has hosted Murder Mystery Events - an adult evening of mystery, intrigue, and delicious food - not to mention, great entertainment & fun! 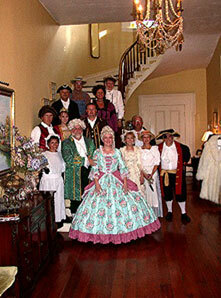 Enjoy a hilarious game, an elegant Gourmet Dinner, and the comforts of a wonderful historic home. You'll wonder when you last laughed so much or had so much fun! Simply, invite 8-20 of your closest friends or family members for a truly unique group social at Maple Hill Manor. We'll help you coordinate your party by providing the place, invitations, list of characters, suggested costume ideas, a dinner menu, and deluxe B&B Accommodations. We even take care of all the preparations, cooking, and cleaning - it's just that easy. We do all the work, you enjoy all the fun! Arrive on your scheduled date and enjoy the experience! For more information about our Murder Mystery events, please visit our website and find the Murder Mystery events page under "Wedding & Events" in the top menu. Every Guest Room features a furry, huggable teddy bear made from the luxurious Alpaca Fiber from the Alpacas raised on the farm at Maple Hill Manor. We believe these are quite possibly the "softest, most huggable teddy bears in the world". They are very popular with our Guests, many of whom like taking "their guest room companion bear" home as a memento of their stay! The Alpacas raised at Maple Hill Manor Farm contribute to this effort by annually "donating" their fiber that is used to make these adorable keepsake bears - as well as for yarn, sweaters, capes, scarves, hats, gloves, blankets and much more featured in the Maple Hill Manor Farm Store. The Bears are a favorite item and come in a wide variety of colors and sizes. There are several bears hibernating in the Farm Store, which can be adopted as well! So, feel free to adopt your guest room bear or see the variety of colors in the farm store - 23 natural colors are produced by Alpacas, more than any other fiber-producing animal. Enjoy your designated Guest Room Companion Bear during your stay - but be forewarned - it is very easy to become attached! Feel free to insist on the adoption papers at the time of check out. Cuddle awhile and you will soon discover the child-like behavior from yesteryear! Cuddle Often - It works Wonders! Thomas McElroy built this beautiful Greek Revival Plantation Home on nearly 600 acres and presented it as a Wedding Gift to his young bride, Sarah Maxwell. Lavished with numerous architectural features, it is accented with Italianate detail, spans over 7,000 sq. 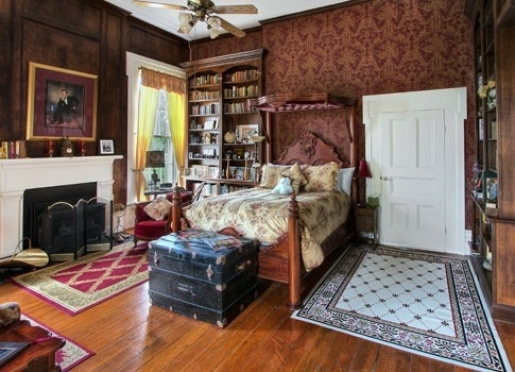 ft., with 14' ceilings, 12' doorways, 9' windows, 13 original rooms - most are 20' x 20' with some even larger, and a grand cherry floating spiral staircase. 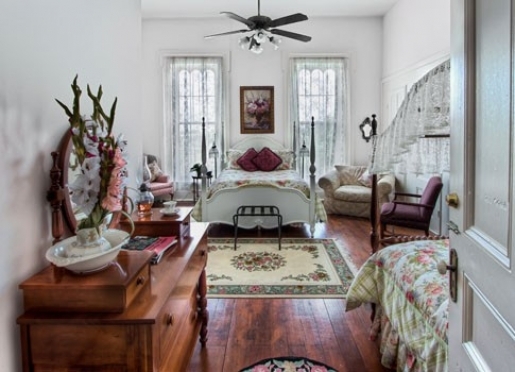 Listed on the National Register of Historic Places and considered a Kentucky Landmark Home. Maple Hill Manor offers 15 acres which includes an Orchard of Fruit Trees, Raspberry Bushes, Grapes, and a Wooded & Wildflower Nature Preserve with walking paths. We also raise Suri Alpacas, Llamas, a Kentucky Mountain Horse - Pretty Penny, 2 Golden Retrievers - Sophie & Sammy, and several barn cats available for your enjoyment! We specialize in Suri Alpacas which represent only 2% of the overall Alpaca population in the world. 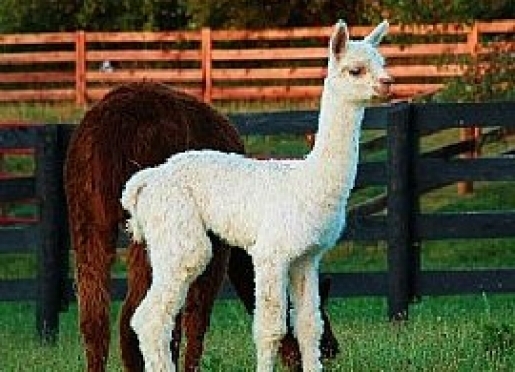 Maple Hill Manor is one of the first farms in Kentucky to raise Alpacas and Llamas! We are the largest Suri Breeding Program in Kentucky. These rare and exotic South American animals are as beautiful as they are fascinating. The fleece of the Alpaca, especially the Suri Breed, is considered to be one of the finest fibers in the world! We breed, board, show, sell, and feature fiber products on our farm. Guests of all ages enjoy these wonderful animals - whether it's an overnight stay or a Farm Visit. Groups welcomed too - with advance notice. Click here to read all of our reviews on Trip Advisor.